Our Philosophy is to provide individualised, holistic care to those who have been diagnosed with cardiac problems in order to return them to a life they consider to be normal, and empower them to reduce the risk of futher events. We see our program as an important part of recovery and it can certainly make a difference. We invite all patients to an assessment before and at the end of their individual programme. This will also consist of a functional test to assess their fitness and capabilitites for exercising. We aim to restore patients with Heart Disease to a full and active life.All who attend are seen by a Cardiac Sprecialist Nurse and a trained exercise professional. The exercise session, consisting of a warm up,circuit and cool down, is closely monitored by the staff in attendance using tools such as the Borg Scale to identify the clients percieved ratio of exertion. Progression is made through a series of levels. The progression is based on the capability of the individual and takes into account other conditions such as mobility or joint problems. After the exercise has completed, a short break is followed by the equally important educational component of the program. This consists of the following topics. 1. How the Heart works. 2. The Psychological effects of Heart Disease on you and your family. 3. Stress Management and Relaxation. 6. Medications for Heart Disease. 7. Safe exercise for Cardiac Patients. We have 8 programmes running throughout Buckinghamshire each offering the same level of supervision, monitoring and expertise. Both men and women of all ages from the young to the very young, attend each group. The sessions last 2-3 hours. The general course lasts for 4-8 weeks. However, we realise of course that people are individuals at different stages of recovery, and a program that benefits them could therefore be completed in a little as four weeks. Others may take longer and this is assessed weekly.We also offer a supported home programme if preferred. 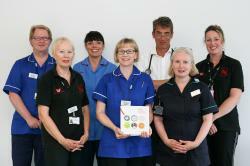 The program is coordinated by a fulltime Cardiac Specialist Nurse who provides as part of a team, phases 1-3 across the Buckinghamshire Hospitals NHS Trust site. The program is supported by trained senior physiotherapists, 2 exercise professional and a physiotherapy assistant. Family and friends are indeed anyone with an interest are more than welcome to join us at the education session.